That’s where Ricci came in. He insisted Lettsome submit a recording of himself performing a couple of his pieces to the Jazz Ahead residency. 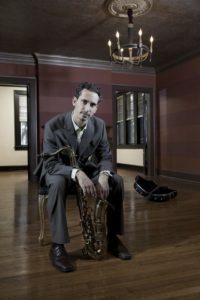 Having worked one-on-one with Lettsome helping him cultivate his abilities, Ricci had unfurled techniques for jazz composition based on his own previous works to aid Lettsome in fleshing out his own pieces. 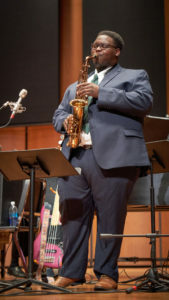 While at the residency March 20-31 at the Kennedy Center in Washington, D.C., Lettsome will be tutored in performance, arrangement and composition by Kennedy Center Artistic Director for Jazz Jason Moran, along with seven jazz masters who were mentored by the legendary jazz vocalist Betty Carter: trumpeter Darren Barrett, pianist Xavier Davis, vocalist Carmen Lundy, drummer Ralph Peterson, bassist Reuben Rogers, saxophonist Mark Shim and guitarist Mark Whitfield. The program culminates in three concerts on the Kennedy Center Millennium Stage at 6 p.m. March 29, 30 and 31, in which the graduates will perform original compositions. The performances are free to the public, and will also be broadcast live on the Kennedy Center website. That roster includes pianists Jason Moran and Aaron Parks; guitarist Lage Lund; trombonist Andre Hayward; bassist Ameen Saleem; violinist Miri Ben-Ari; vocalists Daniela Schaechter, Grace Kelly, and Jazzmeia Horn; saxophonists Marcus Strickland and Jon lrabagon; and drummer Jamison Ross, among others. Lettsome, who grew up on Jacksonville’s Northside, became spellbound with music in elementary school, when at age 8 he was walking out of the cafeteria and got handed a flyer for a summer band program. He asked his mom if he could go, she got him a saxophone, and he was hooked. After graduating from Jacksonville’s Douglas Anderson School of the Arts and being accepted to JU, Lettsome landed in a music enrichment project begun by Ricci, in which students were charged with transcribing a modern jazz song and bringing it in for the group to play. Sophomore year, he decided it was time to write his own song, and he spent two years polishing and fine-tuning it. The result was the ballad “Black Rose,” written for his fiancé, Amber Rose. The two met in sixth grade in band and have been a pair since 2012, after mutual friends told Lettsome that Rose wanted to go to prom with him. She’s also a senior at JU, majoring in biology, and will graduate along with Lettsome this spring. Lettsome enthusiastically praised Ricci for his guidance and influence in helping understand technique, approach and distinctiveness in composition. Showing someone how to perform and compose isn’t enough, Lettsome insisted; allowing someone to be their own performer and composer takes a selfless and empathetic mentor. Reflecting on his newfound success, Lettsome said he wanted to thank the Music Division faculty, including Dr. Rinne, Ricci and Associate Professor of Music Timothy Snyder, for believing in him. 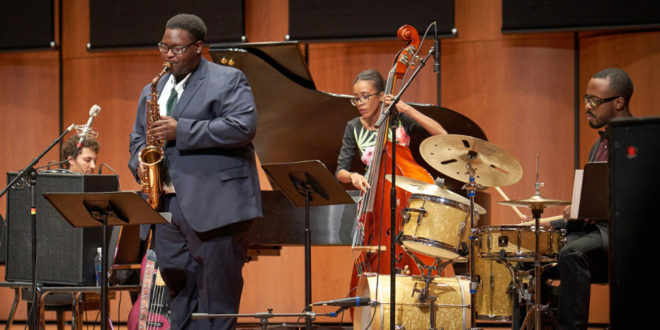 For more about the Betty Carter Jazz Ahead international residency and to watch the March 29-31 live performances, visit http://www.kennedy-center.org/video/index/M6683.